The Niagara Glen is one of my personal favourite places to take my visitors. 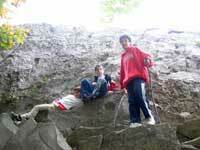 It is 2 kilometer (1 1/4 mile) north of the Whirlpool on the Niagara River Parkway, Niagara Falls, Ontario. There are memorable nature trails, a speciality nature boutique and lots and lots of wonderful green picnic areas. And it's Free. 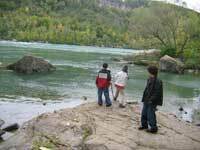 Nature Trails stretch 4 kilometers (2 1/2 miles) down into the Lower Great Gorge or Devil's Hole Rapids to the shore of the Niagara River. The speed of the water through the Gorge is 40 kilometers per hour (25mph).The well laid out trails are color coded with the estimated completion times so you can pick the trail to suit your style. 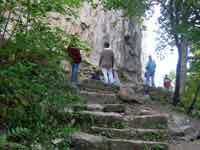 The stairs down into the gorge are the biggest hurdle but then again it does get you up and down quickly. 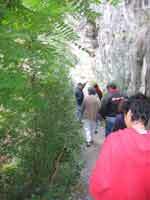 The Niagara Glen is a nature reserve containing wild flora and fauna and geology to explore. 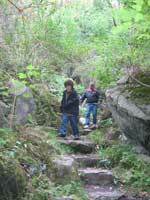 Please observe all posted regulations, stay of trails that are marked and follow generally accepted trail etiquette. It is open year round, weather dependent in winter. The trail is not maintained in the winter but that hasn't stopped me from enjoying the trails and taking some wonderful pictures. There are covered picnic pavilions, many picnic tables and lots of green grass to relax on. The smells that fill the air from nearby barbeques always makes me hungry. 7,000 years ago, this area, Wintergreen Flats was the site of the ancient water falls. The overhanging rock is named the 'Stern of the Great Eastern'. The rock is shaped like the stern of the British iron steamship 'Great Eastern', a famous passenger liner built in 1858. It was the largest ship in the world (22,374 tons) for 48 years. Lockport limestone rock caps the Wintergreen Flats. It was formed 400 million years ago from a salt water ocean which first covered this region. The rock layer is approximately 80 feet thick. The waters of ancient Lake Iroquois (Lake Ontario) were about 137 ft higher than current levels of Lake Ontario. When the Falls eroded the south end of present Niagara Glen, the water-flow of inland lakes were seven times greater than today. Waters of ancient Lake Iroquois draining into the Mohawk River Valley caused the lake level to drop 30 meters (100 ft) resulting in a water fall 37 meters (120 ft) in height above the plunge pool. Just south of here, the water flowing over the Falls increased greatly when the waters from the upper Great Lakes began flowing into Lake Erie (upstream). This increased the amount of water flowing through the Niagara River downstream towards Lake Ontario. An ancient island similar to today's Goat Island existed then. The water flowing around both sides of this island created 2 water falls until the main gorge to the east eroded back far enough past the tip of the island cutting off the flow from the west to create a single Falls again. Wilson Terrace is first level and steepest below the Wintergreen Flats. It was named after the James Wilson (first superintendent of the Queen Victoria Niagara Falls Parks) for his desire to preserve the glen as a nature area. The ancient falls caused layers of rock to erode and break away, falling to river bottom, restricting the river-flow and creating today's Devil's Hole Rapids . The rocks that make up the terrace are Clinton limestone and Thorald Sandstone. Foster's Flats is closest to the river and approximately 11 meters (35 ft) above the surface. This is the remains of the old river bottom composed of Medina Sandstone and Queenston Red Shale. It got its name from a hermit who lived in the Niagara Glen in the 1850's. He received permission to build a sawmill on the edge of the river and made a simple living cutting down trees in the Glen and floating the wood down-steam for sale in Queenston. Queen Victoria Niagara Falls Parks Commission acquired the Niagara Glen property in 1894. Schedule:	Open year round, weather dependent in winter.